Up until last year, film historians thought the first movie produced in Azerbaijan dated back to 1916 with Svetlov's movie, "In the Realm of Oil and Millions." Then Aydin Kazimzade discovered a small newspaper announcement in the archives of the Lenin Library in Moscow, providing evidence that film in Azerbaijan really dates back nearly 20 years earlier to 1898. Instead of being a latecomer to the fascinating world of cinematography, Azerbaijan was, indeed, among the first countries involved. Last year, Azerbaijan celebrated 80 years of cinematography; next year, because of this new historical proof, they'll celebrate 100! 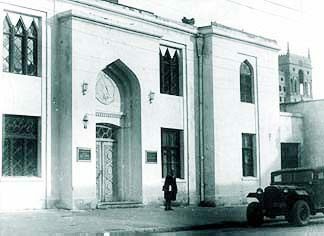 Left: The first film studio in Baku established in the 1920s. The location of the studio was behind the Government Building. It no longer exists. When the Lumière brothers of France premiered their first motion picture footage in Paris on December 28, 1895, little did they know how rapidly it would capture the imagination of the public and ignite a new age of photographic documentation. Nor did they know that their invention would usher in one of the most creative art forms ever known to mankind which would document, while at the same time shape, the history of mankind. These ingenuous brothers, Auguste (1862-1954) and Louis (1864-1948) invented an apparatus, patented in February 1895, which they called the "Cinematographe" (and from which is derived the word, "cinematography"). Their apparatus, doubling as a early motion-picture camera and as a projector, borrowed heavily from Thomas Edison's "Kinetoscope" and Emile Reynauld's "Theatre Optique." The Lumière brothers' film, shown publicly for the first in 1895, is recognized as the first movie ever made. Rather mundane in nature, its title was "La Sortie des Usines Lumière" (Lunch Break at the Lumière Factory). It was first shown at the Grand Café on the Capucines Boulevard in Paris. Immediately, the concept for motion pictures swept beyond the borders of France. It's not surprising that this apparatus soon showed up in Baku. At the turn of the 19th century, this bay town on the Caspian was producing more than 50 percent of the world's supply of oil. Just like today, the oil industry attracted foreigners eager to invest and to work. The service industry quickly followed on the heels of the oil industry. And so a Frenchman by the name of A. Mishon was among those entrepreneurs who came and settled in Baku. A photographer and cameraman by profession, he is believed to have lived in Baku for more than 25 years where he set up a photo studio on Mikhailovski Street, now known as Aziz Aliyev Street. Mishon became active in forming a scientific photo circle in Baku and became its secretary. From 1879 to 1905, he documented landscapes, episodes from oil extraction, the refining process, as well as the oil gushers eruptions and terrifying fires that broke out in the oil fields. Copies of his photos still exist today. "On Sunday, August 2, 1898, A. Mishon, will show some motion pictures that he has taken with a Lumière movie camera and which has been improved by the engineer Jules Carpentier. These films of the Caucasus and Central Asia have been prepared for the forthcoming International Paris Exhibition and will be presented only once in Baku at the V. I. Vasilyev-Vyatski Circus Theater. "The following films will be shown: Fire resulting from an oil gusher at Bibi-Heybat oil field, the departure ceremony of His Excellency Amir of Bukhara (now Uzbekistan) in the Grand Duke Alexei steamship, a folk dance of the Caucasus, and scenes from the comedy, 'So, You Got Caught,' which was performed recently in one of Baku's parks. For more detailed information, see the posters. The event starts at 21:00 (9 p.m.)." Needless to say, the event was an enormous success and Mishon repeated it on August 5, replacing the final two works with those showing life in Balakhani outside of Baku. Left: From "Fatali Khan," 1947. Movie depicts the struggle to unite separate khanates into one united Azerbaijan. Right, Fatali Khan (Alasgar Alakbarov) speaking to an emissary from Russia. Mishon's films obviously made an impact at the Paris Exhibition. They must have attracted more foreigners to the oil-booming town. Reference was made, rather jokingly to these films in a play entitled, "Oil Gusher" written by the Azerbaijani poet Abbas Sahhat (1874-1918) and staged in Baku. The hero of the play comments that when he saw the films at the Paris Exhibition, he immediately set about to come to Baku to find a job. 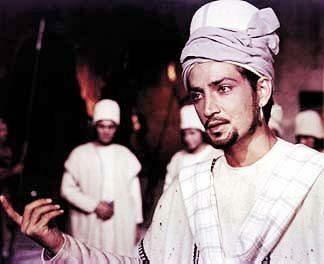 But he complains that when he arrived, Balakhani which had seemed so beautiful in the film was in reality such a run-down place. In the play, he laments, "I came here, found a job, got a position. But, now, how am I supposed to live in the midst of all this dirt, dust, mud and fumes?" Mishon's footage still exists. "Folk Dance of the Caucasus" was later used in a documentary and scenes from "Oil Gush Fire in Bibi-Heybat" were shown in France in 1995, in a film commemorating the 100th anniversary of world cinema. On November 27, 1899, an article entitled: "Implementation of New Inventions" was published in the "Kaspi" newspaper, written by Hasan Zardabi, writer, scientist and social activist. He observed, "Now we have in our hands a toy machine-called "kinemato-graphe." This wonderful machine was produced only a short time ago and gives the impression of being just a toy. You can find this machine which is called 'stroboscope' in many optician shops." This fact would indicate the early replicas of this first Azerbaijani apparatus-stroboscopes-were being sold in Baku at the turn of the last century. Between 1907-1910, archival footage indicates that Mr. V. Amashukeli, one of the founders of the Georgian cinematography, produced footage dealing with life in Baku "Types of Baku Markets," "Strolling along the Seashore" and "Work on Oil Rigs." 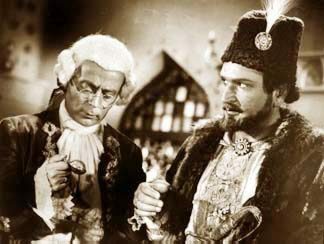 Left: Rasim Balayev as Nasimi, the famous poet, in the movie by the same name, produced by Hasan Seyidbeyli in 1974. In 1915 the Pirone brothers of Belgium set up a film production laboratory in Baku. They invited film director Svetlov from St. Petersburg to work for them and produce "The Woman," "An Hour before His Death" and "An Old Story in a New Manner." It was Svetlov who also directed the film entitled "In the Realm of Oil and Millions" which later became so well known. The famous Azerbaijani actor Husein Arablinski played Lutfali, the main role in this film. In 1917, a documentary entitled "National Freedom Holiday in Baku" was made. The film includes footage taken of the central square of Baku, its streets, avenues, parks and the seashore. In 1919 during the short-lived independence of the first Azerbaijan Democratic Republic, a documentary called "The First Anniversary of the Musavat Power in Azerbaijan" was made. Filmed on Azerbaijan's Independence Day, May 28, this chronicle premiered in June at several cinema houses such as "Express," "Record," and "Forum." 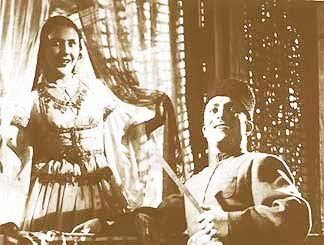 Arshin Mal Alan-"The Cloth Peddler"
Left: From the 1945 version of "Cloth Peddler" (Arshin Mal Alan) based on the musical comedy by Uzeyir Hajibeyov. It won the Stalin Prize. Leila Badirbeyli plays Gulchohra. The first version of the operetta "Arshin Mal Alan" was directed by Svetlov in 1916. 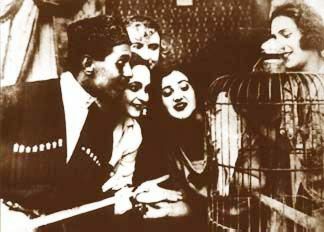 Since this was still the era of "silent" film, the musical selections had to be performed by in-house musicians. Furthermore, as this was still early in the era of theater, two of the women's roles in the film were played by men. Gulchohra was played by Ahmad Aghdamski and Aunt Jahan was played by Y. Narimanov. The other women's roles were played by Russians, not Azerbaijanis, who at that time mostly remained traditionally secluded and veiled. A. Olenskaya played Asya and Y. Olenskaya played Telli. Despite their efforts, the quality of the film did not satisfy Uzeyir Hajibeyov, who had written the original operetta (1910). However, the audience watched with great interest. An article in the "Sovgat" (Present) newspaper on January 17, 1917, noted that it would have been much easier to have found a ticket for a Shalyapin concert than for this film. A second version of "Arshin Mal Alan" was produced in 1917 by G. Belyakov from St. Petersburg. Belyakov did not ask Hajibeyov's permission to make a film. Nor were there any backdrops or stage settings. All the scenes were filmed in courtyards of houses and in the "Forum" cinema house. The only backdrop that Belyakov used was carpets which he thought made the film distinctly Azerbaijani. All the actors were amateurs. As the quality of the film ended up being so poor, Hajibeyov eventually managed to pull it out of circulation. Despite all these simple beginnings, cinema had taken root. There were no film studios in the beginning. Nor was there any systematic cinematic technique. Nevertheless, it's evident that people were passionately enthusiastic about film from its earliest beginning. Left: From "In the Name of God" (Bismillah), 1925. Directed by Abbas Mirza Sharifzade. It exposed the criminal activities of fake clergy. After the Soviet power was established in 1920, Nariman Narimanov, Chairman of the Revolutionary Committee of Azer-baijan, signed a decree nationalizing Azerbaijan's cinema. The People's Education Commissariat, which functioned somewhat like a Ministry, created an art department which included a film section headed by Hanafi Teregulov and Muslim Magomayev, a notable composer and opera singer. In 1922 the government of Azerbaijan decided to create the first cinema factory which became the forerunner of today's film studio "Azerbaijanfilm." In 1923 the Azerbaijan Photo Film Institution (APFI) was established by a special decree of the Council of People's Commissars. The Institution controlled all the movie houses and distribution bureaus. The institute was built on the premises of what had been a fashionable restaurant, "The Renais-sance," prior to the Revolution. It opened on April 28, 1923. And thus, a new epoch in the history of Azerbaijani cinema began-a period when Soviet ideology, not individual entrepreneurship, dominated the film industry. Now more than 70 years later, Azerbaijani filmmakers are again dealing with issues similar to those faced by cinematographers prior to the establishment of the Soviet Union in 1920. Once again, both choice of content and sponsorship of films are largely left up to the initiative of the filmmaker. Aydin Kazimzade is Director of Azerbaijan's Cinema Museum and Assistant Editor of the Encyclopedia of Azerbaijani Cinema.